The 1901 census shows Frederick living with his parents and siblings at 12 West Park Road, Southampton. Frederick’s father was “living on his own means” whilst his brother George was a Commercial Clerk. Frederick was employed as a Seedsman. In the 1911 census Frederick’s parents were living at Kildare, West Park Road. Charles is now a Traveller and has his own business and deals in Whisky. Also at the address is a grandchild, Ernest George (not able to discern whose child this is); Reginald Gurton, shown as a Professional Cricketer (no further information can be found concerning this), a visitor Annie Gerard and 4 boarders. Frederick, in 1911, had moved to Hereford, living as a boarder at 1 Brooklands, Victoria Street. He was still a Seedsman and described himself as a Shop Man and Salesman. Lily Mary Whitfield also known as Lydia Mary was living with her parents at Glenlyn, Khartoum Road, Highfield, Southampton in 1911. She was working as a Seedsmans Clerk and this is how she may have met Frederick. Lily was born in Southampton in 1884. Frederick and Lily married and their only child, a daughter, was born the following year (more detail included below). Private 535577, “B” Company, 2/15th (County of London) Battalion (Prince of Wales’s Own Civil Service Rifles), London Regiment. Killed in action 31 October 1917. Aged 33. Born Southampton, enlisted Hereford. Son of Charles and Mary Baker, of Southampton; husband of Lily Mary Baker, of Hereford and 7, Khartoum Rd., Highfield, Southampton. Buried in BEERSHEBA WAR CEMETERY, Israel. Section N. Grave 35. BAKER, FREDERICK CHARLES, Private, No. 535577, 15th Battn. (Civil Service Rifles) The London Regt. (T.F. ), s. of Charles Baker, of Oxford Street, Southampton, by his wife, Mary Elizabeth, dau. of George Gerard b. Southampton, 25 Jan. 1884; educ. Taunton’s School there; was a Seedsman; joined the Civil Service Rifles 4 May, 1917; served with the Egyptian Expeditionary Farce in Palestine from 10 Sept. 1917, and was killed in action at Beersheba 31 Oct. following. Buried in Wadi Halgon Military Cemetery, Yahia. Lieut. F. Lewis wrote: “He was in the leading line of the company, and was hit by a machine-gun bullet during the advance, and it might help you to know that he never knew pain. He was a soldier and died a soldier, and his death is felt very much by every one in the company.” He m. at Southampton, 18 July, 1911, Lily Mary (7, Khartoum Road, Highfleld, Southampton), dau. of David Whitfield, and had a dau., Marjorie Isabel, b. 31 July, 1912. Education and Employment: After leaving school Frederick worked as a seedsman. He began work at Toogood’s in Southampton then spent 9 years living in Hereford where he was employed as a shopman and salesman for a seedsman. Life during the war: Frederick was living in Hereford when he enlisted in the army. He had married Lydia Whitfield at Highfield Church in Southampton on 18th July 1911 and their daughter Marjorie was born in Hereford on 31st July 1912. 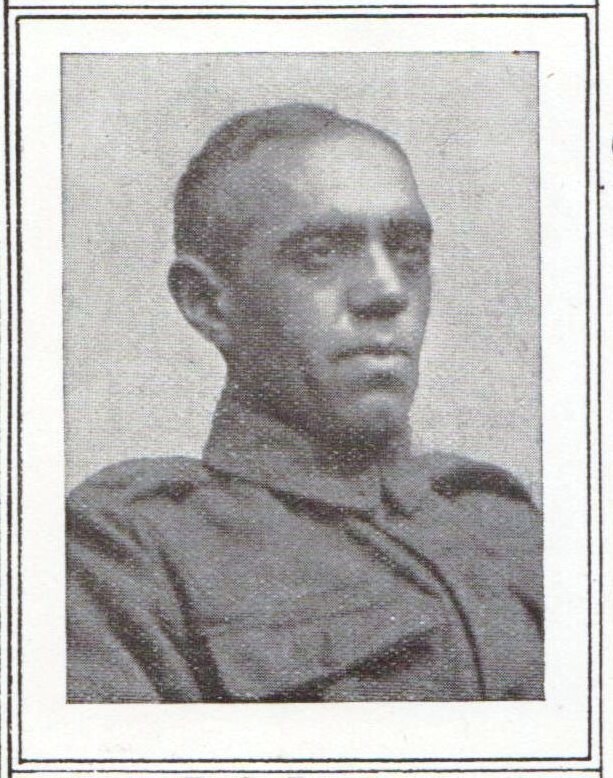 He joined the Civil Service Rifles in May 1917 and served with the Egyptian Expeditionary Force in Palestine from 10th September 1917. He was in the leading line of the advance at Beersheba when he was hit by a machine gun bullet and killed. He was buried in Wadi Halgon Military Cemetery in Yahia. Frederick died on 31st October 1917 aged 33 years. Personal Effects – As his widow, Lydia received all monies and credits that were owed to her husband. On the 7th February 1918 she received £3 5s 10d and a further payment of 2s 10d on the 25th March 1918. She was also entitled to a war gratuity of £3 paid on 15th November 1919. These amounts were also for their child.